If you’re a Google or Amazon stockholder, you don’t want to check their prices online right now. 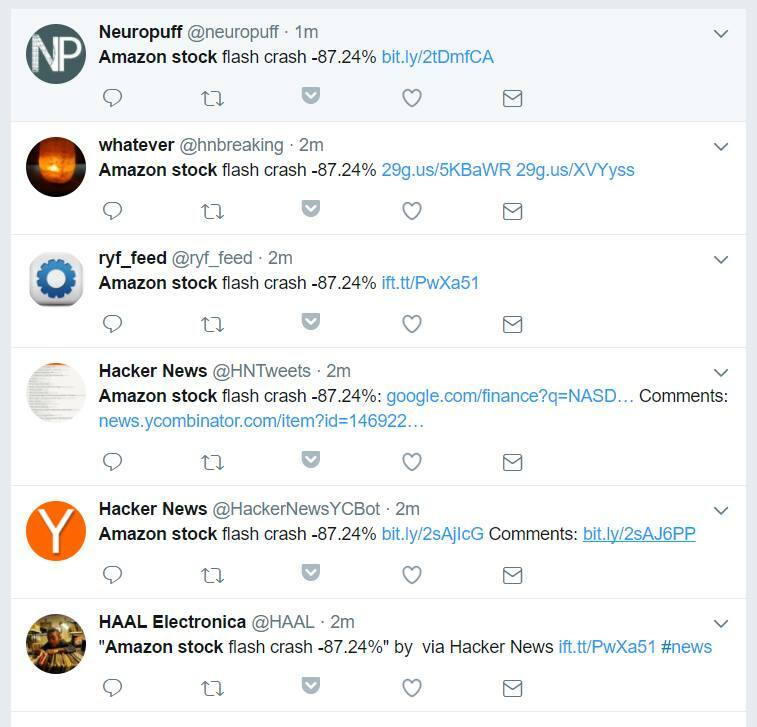 A software glitch has caused online finance portals to report the prices of major tech companies down by as much as 80%. 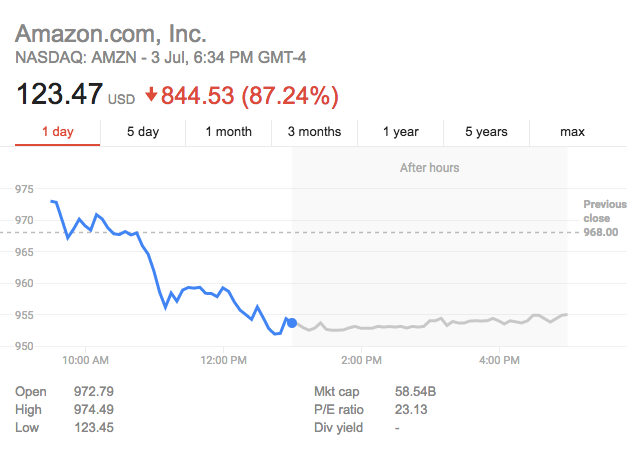 As of 10:34 am IST, Google is reporting the price of Amazon down by a staggering 87%. 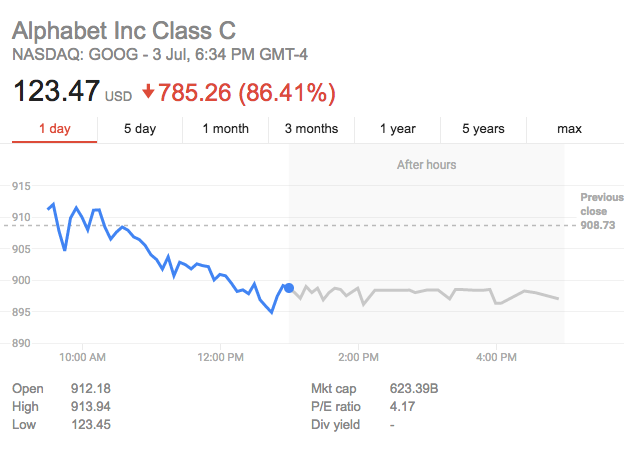 Google is reporting its own stock down by 86%. 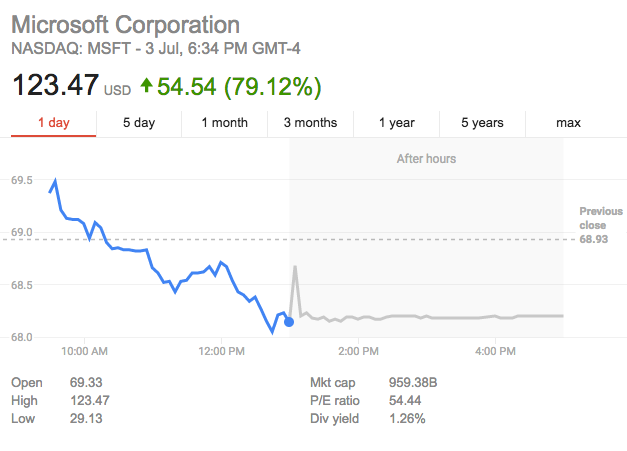 Microsoft, on the other hand, shows its price up by nearly 80%. The glitch was first reported around 5 hours ago, and doesn’t seem to have been still fixed. It’s affected not only Google Finance, but also Bloomberg’s platform and Yahoo Finance. NASDAQ is reportedly investigating the matter, but it appears to be a simple software bug — while the graphs in the stock report as accurate, the prices of all three stocks seem to be stuck on 123.47 for some inexplicable reason. The percentages are being calculated over the change of the current real stock price vs 123.47 — Google and Amazon, which trade at nearly $1000, are shown at a steep discount, while Microsoft, which trades at around $70, is shown to be significantly up. Yo wtf is happening with $amzn $aapl $goog ?? I'm either broke or there is a glitch. Things though became clear soon after — the official NASDAQ site, fortunately, was still displaying accurate prices. People began speculating what had caused the glitch. I think one of the @YahooFinance interns fell asleep on the keyboard and just gave @amazon and @Google shareholders a heartattack. I know this $AMZN price quote is a glitch but it can't inspire confidence…flash crash Wednesday? The stock prices now appear to be corrected on Yahoo Finance, but Google is still displaying the 123.47 price. We’ll update this post if we have any more information.